Hmmm, so following a recent session of breathe in deeply while putting on your jeans, and now quickly do up the button, I have finally come to the realisation that lack of exercise + loads of carbs (mainly rice) + copious amounts of cakes (big weakness of mine) = an expanding waistline and generally feeling unfit. 1) Mr Lotions & Potions recently bought an interesting looking fitness devise called the Total Core – funnily enough I laughed when I saw it so I guess its having the last laugh on me now. 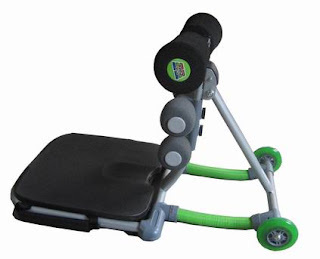 Anyway here’s the blurb from the website “The Total Core Deluxe is an amazing abdominal exerciser that gives you a full, 360-degree, total core workout in one simple and continuous motion, all from a comfortable seated position. The total core deluxe gives you 360 degrees of result from a stress free strain free abdominal exercise. The Total core is easy to use and... You will see visible results in ten days” I tried it out yesterday and so far, i’m impressed. You know how usually you try to sit ups, and you can barely raise your back off the floor and stop when you get to about 10, out of breathe and in pain? Well the Total Core helps to support your back/neck and allows you to do several reps before you start to feel any discomfort. I actually managed to do 70 and this is a major feat for me! I was so pleased that, I did my little “yeah I’m good” dance afterwards. Excitement over, my plan is to get up to a 100 reps soon and start doing sit ups everyday or at least every other day. I read a couple of reviews where a few people complained that it didn’t work for them, it’s too early for me to tell yet but I get the feeling that you (a) need to do quite a large number of repetitions to start to see any difference especially as it helps to make it easier and (b) you can’t rely on the devise alone to see any difference to your body shape. 2) Now its all well and good me doing sit-ups, but I know I also need to do some cardio to burn off the fat and ensure the new muscles I am slaving away for start to show through. So I ventured downstairs to turn on the Wii – yet another devise I’ve been avoiding, unless it has been to beat Mr Lotions & Potions at games. 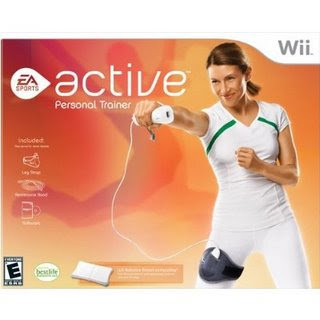 Using the Wii active which is a fitness program with over 25 exercises and activities, I actually really enjoyed it. I did a 30 minute cardio session where I custom built my workout, combining running, walking, dancing and boxing and I found it was really easy to do and follow. I love the mini me on the screen and love seeing her follow my actions. I was both encouraged and pushed by the Wii trainer voice on the screen, with phrases such as “now I know you can do better than that” or “well done I’m impressed with your level of commitment”. Seeing the number of calories burned at the top also encouraged me to push even harder and stopped me in my tracks when I was tempted to reach for a chocolate digestive later on. (the number of calories in one biscuit made me run for the carrot sticks). The Wii active also has a 30 day work out challenge which you can do with a virtual personal trainer so i'm planning to set that up too. 3) Finally I am following the 80/20 rule. I know there is no way I can be good all the time and seeing as I don’t want to have any withdrawal symptoms where I suddenly gorge out on junk food. My plan is to be really healthy with my diet for 80% of the time as well as reduce my portions and add on more vegetables and salad. The other 20%?...well, its cakes all the way - yum. Will keep you posted on my fitness plans and attempts. What about you guys? Has anyone else fallen into the I need to lie down to get my jeans on camp? Or do you have a keep in shape secret? Let me know….